April | 2015 | God Wins...but can I ? After a long, hard winter, I am enjoying my walks this spring. The changes that I see around me are so visually stimulating on the heels of a rough, cloud-covered, Midwest winter. As each year passes, I am experiencing God more and more through nature. In the past, my primary pathways to God were either through information or through relationships. Yet, there are so many ways today that God whispers to me through the natural world around me – making the natural, quite supernatural. “Open my eyes so that my heart really sees” is my prayer. Yesterday, I saw something profound happening to our maple tree. A few years ago, my sister gave us a “tree cross.” It’s a small, ornamental, brass cross that is nailed to the tree. Very symbolic. 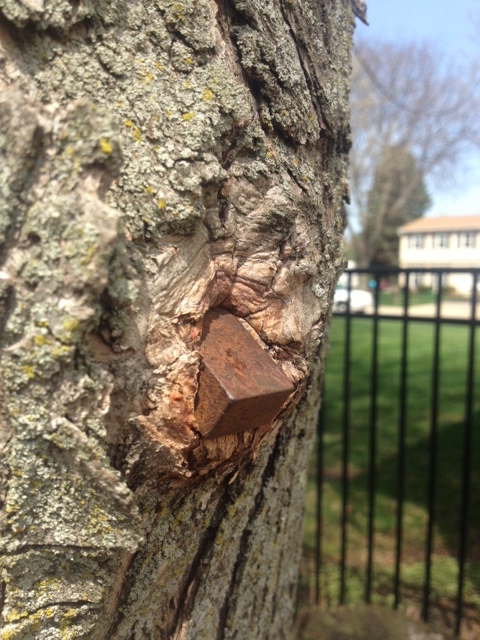 It is amazing as to how the tree is responding to the violation of its bark. The tree is enveloping the cross. It is becoming part of the tree. I am fascinated. I did a google search on “tree wounds.” I found this statement by Wayne Clatterbuck, “When a tree is wounded, the injured tissue is not repaired and does not heal. Trees do not heal; they seal. If you look at an old wound, you will notice that it does not ‘heal’ from the inside out, but eventually the tree covers the opening by forming specialized ‘callus’ tissue around the edges of the wound….new wood growing forms a protective boundary preventing infection.” This activity is called compartmentalization. The way the tree is responding is challenging my heart. It makes me think about the wound that losing Leah has caused. Am I responding as the tree is? I don’t have all the answers, but I am asking the questions. The natural tendency is to protect. Human bodies do it too. Our skin does something similar in absorbing slivers. If we don’t remove them in time, they go deeper into the body. Seems those annoying slivers just go deeper and deeper, if we don’t get them out quickly. Like this tree, I am a living being who naturally does everything I can to survive. Since this wound is becoming part of me, how can I absorb it so that it becomes something beautiful? So I thrive and not only survive. For now, sharing my journey, talking about my loss and honoring Leah’s memory are helping me mend the wound. To be human is to live with either the loss of someone or something we cherish. What wound are you absorbing into your heart? How is it affecting you? I can hear Barbara Streisand singing these opening lyrics to the song People. Can you hear it? The slow, deliberate, beautiful sound of her voice. The lyrics offer such wisdom. I don’t think that I’ve ever really noticed the lyrics “letting our grown-up pride, hide all the need inside” until I just googled the song’s words. How powerful. Hiding is something all of us can do well, isn’t it? Many of us spend our full lives hiding our thoughts, feelings or needs from others. Isolating. It’s too easy for someone suffering from loss and grief to hide. Especially parents who have lost a child because people expect us to withdraw. In some ways we mothers who lost a daughter or son need to isolate, but we need to caution ourselves from separating from others indefinitely. Quickly after losing Leah, Mark and I knew we needed support. We joined a weekly Life After Loss Group at our church the first month after Leah passed away. I was so stunned and shocked after Leah’s death that I don’t remember much of what was said the first several sessions. I was one of a couple hundred attendees who were separated at tables by type of loss – either loss of parent, spouse, child, job, marriage, etc. At our table, there were no other parents who lost a teenager due to cancer. The first table at which we were placed had mostly parents of children who committed suicide. I was in such a tender spot and hurt so badly for these parents that I requested a different table. We were then placed at a table with a variety of child loss: illness, accidents and other circumstances. I attended 13 weeks last year with these amazing parents. Just yesterday, I had a handful of my “table moms” to my home for a visit. It was a joy to be with them. Because you see, there is no one who understands the loss of a child the way another mom does. Family and friends try to identify with us. Yet, no one provides the comfort and strength the way another mother does. We connect without saying a word. Two moms who may have had absolutely nothing in common, suddenly have absolutely everything in common when the bond is a losing a daughter or son. It’s a club that we don’t want to belong to, but grateful there are others in this club who understand. As the six of us visited yesterday, our time together included a mixture of laughter and tears. There were discussions where we laid out a challenging scenario and we each immediately understood. One moment that specifically touched me was, as the ladies were leaving, when I made the statement, “You know [14 months later], there are moments when I am still in shock that Leah is gone.” Immediately all five of them nodded their heads signaling a resounding “Me too.” Including a mom who lost her son 4 years ago. There was something in that moment that was a balm to my hurting soul. One of the dear moms reads my posts and knows Leah loved cupcakes. 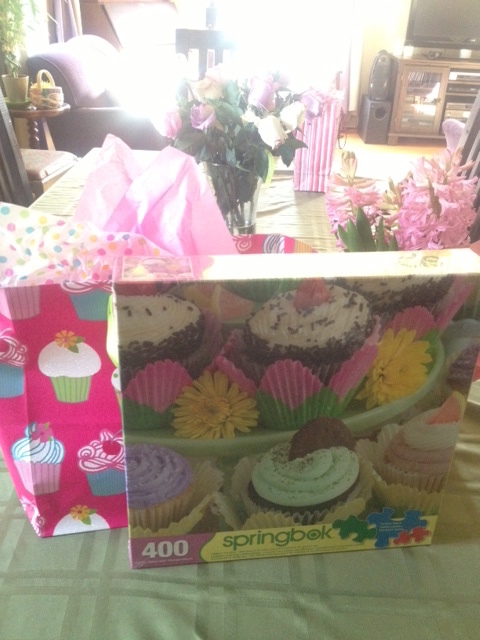 She brought me this cupcake puzzle. What an amazingly personal and perfect gift. Little did she know that Leah enjoyed doing puzzles during her illness. I am so grateful to have these ladies in my life. During Leah’s illness there was another mom who made a major impact on me. One of the most meaningful conversations I had, when Leah was very sick, was with a woman who lost her teenage son to Leukemia. This mom and I didn’t know one another before Leah’s illness. She heard about our circumstance through a mutual friend. She offered to come for a visit one day. Sharing from a deep place, she said that often it was hard for mothers of terminally ill children to talk with her because her son died. She gently offered key suggestions about things that I could do to honor and celebrate Leah, while Leah was still with me. She encouraged me to mark moments with Leah and write down specific words that we said to one another. She encouraged me to videotape conversations with Leah, but I got caught by Leah so that didn’t work! Due to talking with this mom, I found ways to take pictures of Leah that I wouldn’t have otherwise. I got a great photo of Leah’s eyes and hands. I took notes of things that Leah and I said to one another. If I didn’t speak with this lovely mom, I would have never thought to do these things. Her visit was like that of an angel. I hope that I continue to reach out to other parents. And in turn, make myself available to others who need support. Whatever life challenge you have, take the risk and reach out. There is someone you need … and … someone who needs you. As I grieve, I picture myself in front of a bridge. I’m standing on one side of it. The side where I have experienced loss. Leah is standing there with me…my parents…my former job. I can replay the circumstances of each loss over and over. I think about driving Leah to chemo and radiation treatments and watching TV with her to comfort her. It’s also easy to remember walking out of the nursing home, after visiting my parents, and feeling helpless. Watching all of them suffer. Hurting for them and with them. And thinking of last projects on which I enjoyed working. There’s a knowing that I can’t stay frozen on this side of the bridge. I have to move. So, I approach the bridge and look ahead to the other side. From here, the other side doesn’t look a lot different. Yet, I can’t see the other side clearly at this time. It’s fuzzy. Even the memories on my side of the bridge begin to look blurry. Time to get on the bridge and start walking to the other side. So, I step on the first wooden plank and start the journey. It’s not an easy walk across. My strides are small and slow because I am unsteady. Still. Two months later … five months later …13 months later. Legs aren’t strong, so I hold onto the rails. The other side looks miles away. Looking down, the gaps in the planks make me nervous. But, I take several steps. Right when I feel my step lighten, a wind on the bridge startles me. A wind that brings a memory – such as filling Easter baskets for little Leah and Grant. Stepping into the card section at Osco, I see the cards that say daughter, mother and father and … I blink away the tears knowing that I will never buy these cards again. I try to feel joy about the cards that I can buy, but this experience is strong. It forces me to take a few steps backward. I even contemplate buying a daughter card, but choose not to. -Should I even attempt to get to the other side? -Do I want to get to the other side? -What will the other side look like? Will I like it? -Is there peace on the other side? Joy? -Will people be patient with me if I am on the bridge too long? -What does it look like to bring the memories with me as I cross? -What does it look like to bring my heart with me as I cross to the unknown? So many questions and not many answers today. Interesting metaphor of a bridge this Easter weekend. The bridge between Good Friday and Easter Sunday is Saturday. One day was a bridge. On the bridge called Saturday, it appeared evil won. This day must have felt like an eternity to Jesus’ followers. This is how I feel today on the bridge – a place of unexpected waiting. Hope keeps me walking across. The belief that there is an unseen Goodness who is coaxing me across to the other side – even when I don’t know what awaits me. I am trusting that, while I know God wins, I can win too. Still trying to figure out what winning looks like for me. I get glimmers of it and hold onto them. 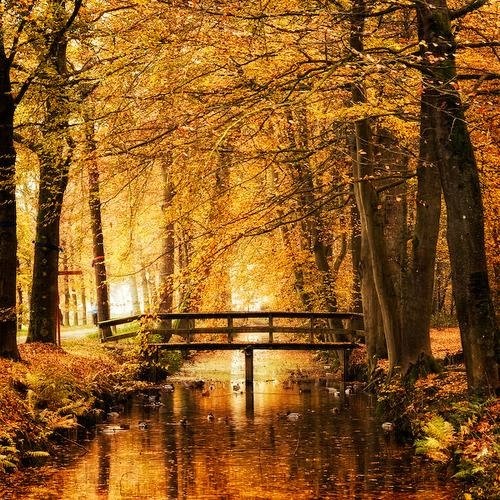 Many of you are walking across your own bridges. Let’s keep walking together. Thank you for inviting me into your hearts as we cross this bridge together.